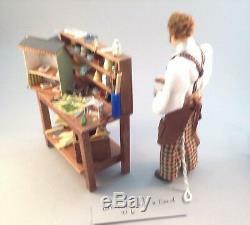 Dad is porcelain and is dressed in a cotton shirt with suspenders and a leather apron. 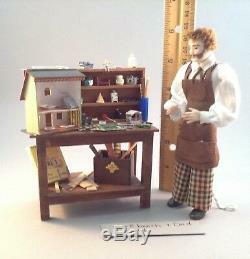 He is working on a cute little wooden dollhouse with lots of tools and accessories on workbench. 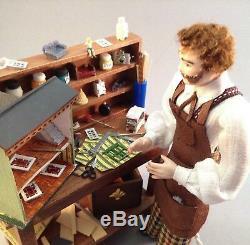 The item "Dollhouse miniature 1/12th scale porcelain Dad & work bench by Jan Smith" is in sale since Saturday, December 1, 2018. 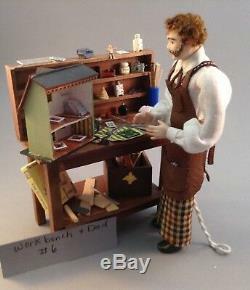 This item is in the category "Dolls & Bears\Dollhouse Miniatures\Artist Offerings".kinlo" and is located in Clearwater, Florida.